Every three years, the High King of Tara had to throw a feast for all the people of Ireland, lasting seven days and seven nights. One High King, Diarmait son of Cerball, was finding it hard to cover the expense of this feast, and he looked out at the great plain of Tara, with seven views on every side, and he wondered if he might cultivate some of that good green land, and put it to profit, to offset the costs of the feast. All the people of Ireland began to arrive for the great feast in Tara: kings and queens, chieftains and chieftainesses, youths and their loves, maidens and their lovers, people of all degree and class arrived, and were seated according to their station: the kings and ollaves (that is the highest rank of bard) sat around the High King, the warriors and fighting men were all put together, and the youths and maidens and proud foolish folk were put in the chambers around the doors, and everyone was given their proper portion of the feast, and though the best of the fine fruit and oxen and boars went to the kings and ollaves, nobody at all would go hungry. But Cennfaelad, too, refused to answer the question of what to do with the Manor of Tara. He insisted they ask his five seniors, the oldest and wisest people in Ireland. But when the five elders arrived, they wouldn’t partition Tara and its manor unless their senior said it was alright. At this stage, Diarmait was getting frustrated, and the feast was growing cold, so he sent at once for the man named by the five seniors of Ireland. 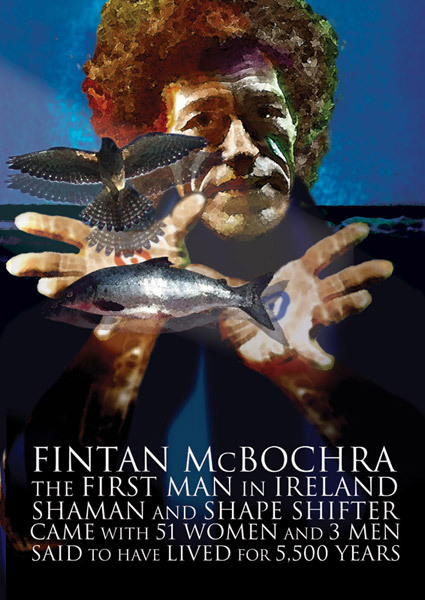 That man was called Fintan Mac Bochra, and he had lived for so long that his legend had grown and fallen again into obscurity, until only the oldest and wisest people had ever heard of him. Fintan had his home in Tulcha in Kerry at that time, and the people in Tara had to wait until he was sent for, and brought before them. Fintan was given a great welcome in the banqueting house, and everyone was keen to hear his words and his stories, they knew this was a rare thing to have such a sage in their company. They asked him to sit in the judge’s seat, but Fintan refused until he knew what question they had to put to him. He said they shouldn’t make a fuss over him, because he knew he was welcome anywhere in Ireland: Ireland was his fostermother, and Tara was her knee that he rested on, and Ireland had sustained him throughout all the long years of his life, from the time of the Deluge until that time. He told them of all the Invasions of Ireland, an eyewitness account of their ancient history, and told them how, when Saint Patrick came to Ireland, Fintan converted to the Faith of the King of the cloudy heaven. Dairmait was very impressed with Fintan’s great age and great wisdom, and explained to Fintan that he thought the manor of Tara was going to waste, and he thought it would be best to partition it and use it for something profitable. And he asked Fintan if he had any knowledge from history that would help them in the settling of the manor of Tara. “”To know where you come from, and where you’re going, and to know your name,” we answered. “”And what has brought you to the setting, if you were at its rising?” we asked. “”From the Children of Mil of Spain and from the Greeks are our people sprung,” we said, and told him all of the comings of the people to Ireland, and the history of the Sons of Mil before they came to Spain, the same story I told to all of you. “What land is Spain?” asked Trefuilngid. “Conaing said he’d assemble all the people of Ireland for Trefuilngid to see if he wanted, but he thought it would distress the people to feed such a great man as Trefuilngid. But Trefuilngid assured him that the branch in his hand would serve him for food and drink as long as he lived. So, for forty days and nights, Trefuilngid stayed with us all, until all the men of Ireland were assembled for him at Tara. And when he saw them all in one place, he asked them for the chronicles of the men of Ireland in the royal house of Tara. But the people replied that they had no real storytellers to entrust the chronicles to. “Then Trefuilngid said that he would establish the progression of the stories and chronicles of the hearth of Tara with the four quarters of Ireland all about, because he was the most learned witness among them. And he asked them to bring to Tara from each quarter, the seven wisest, most prudent and most cunning people, and the shanachies, to represent the four quarters of Ireland, and so that each of the seven could take their share of the chronicles of the hearth of Tara back to his home province. Then the nobles of Ireland came with Fintan to Uisneach, and they took leave of each other from the top of Uisneach. And Fintan set up a pillar-stone with five ridges on the summit of Uisneach, and assigned a ridge of it to every province in Ireland, showing that Tara and Uisneach are in Ireland as two kidneys are in an animal, and he marked out the portion of each province in Uisneach, and arranged the pillar stone.